I’ve always wanted to stay in one of Leadville’s gingerbread houses. We’ve stayed at The Colorado Trail House in Leadville, which is a beautiful and rather stately Victorian home, but not quite as colorful as some of Leadville’s old homes. 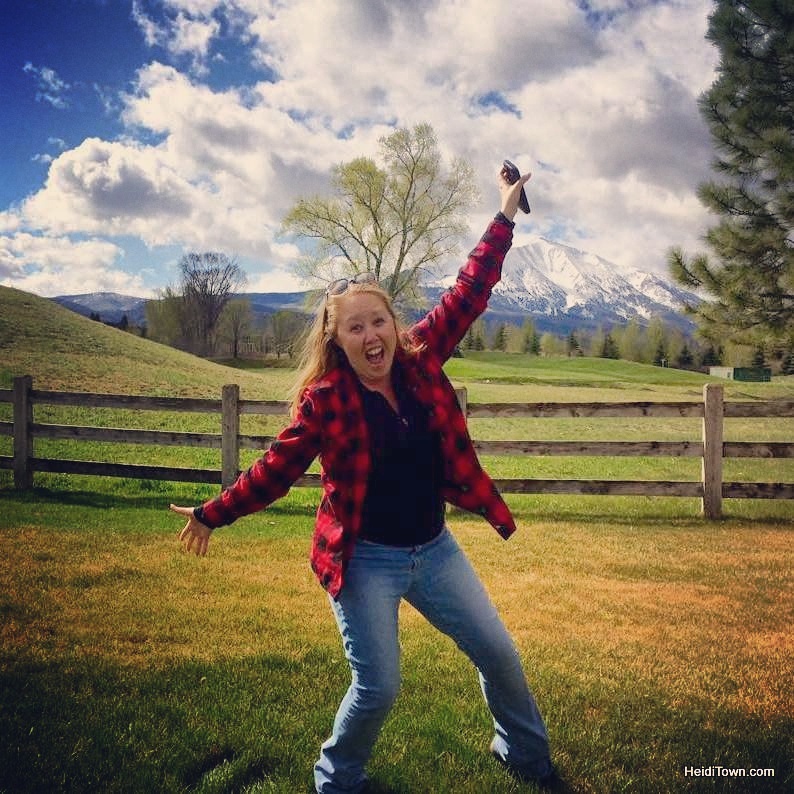 When Rick and Bec, owners of The Colorado Trail House and more recent owners of The Majestic, invited us to stay at their new Leadville property during Crystal Carnival & Skijoring weekend, I jumped at the chance. The Majestic, located on 4th Street, is a boutique hotel in one of Leadville’s gingerbread homes. It’s brightly colored exterior is cheerful, even when the skies above town are leaden gray and threatening snow. It was snowing during our visit to Leadville—a lot. When we pulled up to The Majestic, the piles of snow hugged the old house and icicles hung like decorations from the eaves—postcard perfect. Of course, snow is a lot prettier when you don’t have to shovel it and throughout the weekend we saw homeowners in Leadville digging out every morning. Looking through the window on our first morning waking up in Leadville. That’s 4th Street. First and foremost, the location of The Majestic is perfect. It’s across the street from High Mountain Pies, often cited as Colorado’s best pizza and is one block off Harrison Avenue, Leadville’s main drag. Down the historic, photogenic 4th Street, is a beautiful church and more colorful old homes. 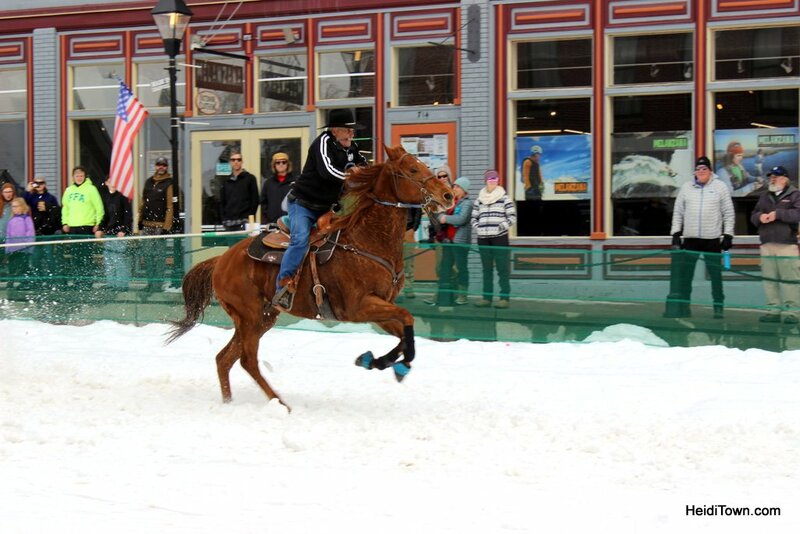 Leadville, Colorado’s Harrison Avenue ready for Crystal Carnival & Skijoring Weekend. 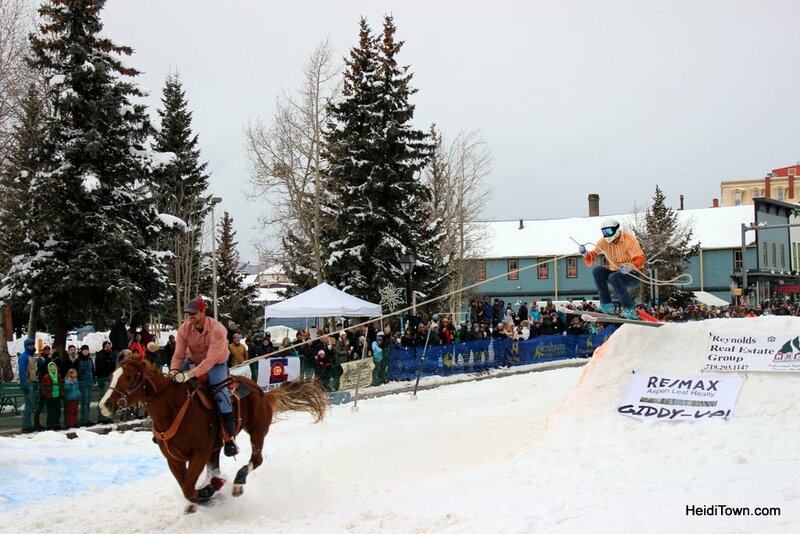 Leadville Skijoring Weekend is exhilarating! We were greeted by a spread of appetizers and drinks Bec had put out for guests. She does this when an event is happening in town and The Majestic was hosting the skijoring emcees as well as the event photographer, Mark LaRowe from Montana. I especially enjoyed sipping mulled wine in the little seating area off the large dine-in kitchen. This is a guest house with a living area in the front that features an inviting fireplace. We spent time here every morning with our coffee. There is also a formal dining area between the living room and spacious kitchen. Appetizers in preparation for an event weekend in Leadville. I am in love with this farmhouse kitchen even the many chandeliers! The Majestic isn’t a bed and breakfast, but they do offer breakfast items for guests and coffee is freshly made every morning at 7 a.m. You may or may not see Rick and Bec during your stay, as they reside in the second story of the home. We utilized the farmhouse style kitchen each morning as we decided to breakfast in on this trip. During our stay, fresh flowers sat on the kitchen table as well as a schedule of the weekend’s events, which I thought was a nice touch. This is a great spot to stay during skijoring weekend because a lot of festivities take place at The Elks Club which is located just behind The Majestic. The second morning at The Majestic after another big snow (and it’s still snowing in this picture). The Majestic also has a backyard with a hot tub, a nice amenity in Leadville whether it’s 10 degrees or 70 degrees, there’s nothing better than a hot soak after a long day at Ski Cooper, or hiking one of the many trails in the area. We got into the hot tub once during our stay. Snow fell onto our heads as we soaked and then made mad dashes to the backdoor so as not to freeze to death in the cold night. Thankfully, the hot tub isn’t far from the door and Bec and Rick have kept the back patio shoveled as much as has been possible as the town is measuring snow in feet this winter, not inches. Sisters Suite, and yes, much to Ryan’s chagrin, I did sing the “Sisters” song from “White Christmas” the entire time we were there. The Majestic has five large rooms that appear in real life as they do in the photographs on the website. We were in the Sisters Suite which features two rooms with pedestal sinks in each. The first room has a daybed exactly like the one I had as a little girl. The second bedroom has a tall double bed. The bathroom can be accessed by each bedroom but the rooms are also connected by a door. It is ideal for a mother and daughter traveling together and while a family of three could fit, the bed is a bit small for a guy the height of Ryan, which is 6 foot. The other four rooms are each unique and sleep two, with The Parlor featuring its own fireplace. This Leadville hotel works well for a lot of travel combinations including families, friends and is perfect for a romantic getaway. Front room fireplace that kept this area so cozy. It was our favorite spot in the morning with a cup of coffee. One of my favorite aspects of The Majestics are the slippers provided to guests in the entryway. There’s a cozy atmosphere in this house and comfy slippers just seem to fit into the scene. I wore them every time I was inside the home. Rooms at The Majestic start at $100 per night. Visit their website at StayMajestic.com to see photographs and to book your Leadville vacation. I’ve often written that “Leadville is one of the last places in Colorado where the Wild West still lives” and staying at The Majestic gives a visitor the opportunity step into this colorful narrative. If you are looking for an authentic Leadville experience, The Majestic is the place you’ll find it. Thank you to The Majestic for hosting our stay.